Directional Motivation is geared to make a difference for our veterans and to recognize their valiant efforts to protect our freedoms. We have the privilege to provide two shining examples of such sacrifice, demonstrated in the lives of Lt Col Mark Weber and SSG John Kriesel. I encourage our visitors to purchase these books to gain a better understanding of what our veterans have endured and I trust that hearts will be stirred by the inspiration and motivation they display. Directional Motivation offers these resources to enhance the sales efforts to further benefit the veteran organizations represented. 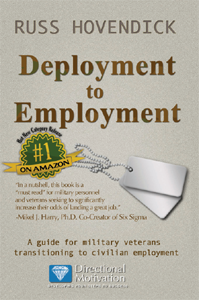 Described by numerous military personnel as being “The one resource that every transitioning veteran should have” this book provides a step by step guide to success in landing civilian employment. The book’s conversational approach and easy to follow steps will provide every reader with the tools needed to land the right job. At the high point of a soaring career in the US Army, Lt. Col. Mark Weber was tapped by General David Petraeus to serve in a high profile job within the Afghan Parliament as a military advisor. Within weeks, a routine physical revealed Stage IV intestinal cancer in the thirty-eight-year-old father of three. Over the next two years he would fight a desperate battle he wasn’t trained for, with his wife and boys as his reluctant but willing fighting force. 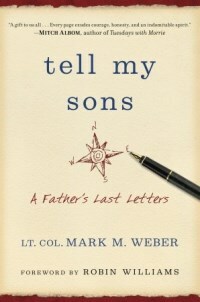 When Mark realized that he was not going to survive this final tour of combat, he began to write a letter to his boys, so that as they grew up without him, they would know what his life-and-death story had taught him—about courage and fear, challenge and comfort, words and actions, pride and humility, seriousness and humor, and a never-ending search for new ideas and inspiration. This book is that letter. And it’s not just for his sons. It’s for everyone who could use the last best advice a dying hero has to offer. Mark’s letter and his stories illustrate that the greatest value of a life is to spend it for something that lives after it. That in the end you become what you are through the causes to which you attach yourself—and that you’ve made your own along the way. Through his example, he teaches how to live an ordinary life in an extraordinary way. 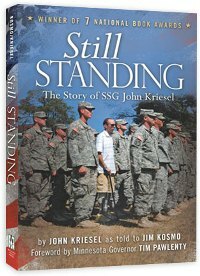 When SSG John Kriesel lost his legs and two buddies in a roadside bomb explosion, no one expected him to survive. He died three times on the operating table. Miracles, a lot of miracles, starting with a few grunts who refused to let him die in Iraq, ripped the young warrior from the grip of death and sent him on to four hospitals, thirty-five surgeries, and months of recovery and rehabilitation. Medical miracles put his body back together, but it was an incredible confluence of angels at every step along the way that breathed life into his shattered body. This is not just another war story. This is the story of an ordinary young man who overcame extraordinary challenges with a lot of help from others, including many strangers, and he emerged stronger and more in love with his country, his wife, his children, and ultimately, his own life.